The pH-dependent binding of Igs to the neonatal FcR (FcRn) plays a critical role in the in vivo homeostasis of IgGs. Modulating the interaction between Fc and FcRn through protein engineering is one method for improving the pharmacokinetics of therapeutic Abs. Recent studies disputed the direct relationship between increasing FcRn affinity and improved pharmacokinetic properties. In this work, we studied the pharmacokinetics of two human IgG1 Fc variants in cynomolgus monkey to further clarify the affinity-pharmacokinetic relationship. First, we report a number of novel Fc point mutations and combination variants, including some with primate-specific FcRn-binding improvements. By studying these variants along with some previously described variants across a wide range of affinities, we discovered a direct correlation of pH 6 affinity improvements with neutral pH improvements, suggesting that all of the tested variants exhibit similar pH dependency in FcRn binding. We then evaluated the pharmacokinetics of variants N434A and N434W, which, respectively, gave ∼4- and 80-fold improvements in pH 6-binding affinity to both human and nonhuman primate FcRn. Surprisingly, clearance of N434W was similar to that of wild type. N434W is the first variant studied in primates that exhibits significant binding to FcRn at pH 7.4, and its clearance substantiates the principle that too much affinity improvement, i.e., beyond that of N434W, does not yield improved pharmacokinetics. In contrast, N434A exhibited a ∼2-fold decrease in clearance in cynomolgus monkey, supporting the notion that modest increases in pH 6 FcRn affinity can result in improved pharmacokinetics in primates. The neonatal FcR (FcRn)4 plays a critical role in the transcytosis and homeostasis of IgG in mammals (1, 2, 3, 4, 5). FcRn, which is structurally homologous to MHC class I molecules, is a heterodimer consisting of a transmembrane α-chain and β2-microglobulin (β2m) (6, 7, 8). FcRn has been shown to transport IgG across cellular barriers, including those in the brain, intestine, lung, and placenta (1, 9, 10, 11, 12). Previous studies in knockout mice illustrated that the serum t1/2 of IgG in FcRn- or β2m-deficient mice was greatly reduced (1, 4), demonstrating the protective role of FcRn in regulating the level of circulating IgG. At the molecular level, FcRn binds the Fc portion of IgG in the CH2-CH3 domain regions (6, 13, 14). The Fc-FcRn interaction is highly pH dependent; IgGs bind FcRn with high affinity at pH 6, but as the pH is raised to 7.4, the binding affinity drops considerably. This pH-dependent interaction is responsible for protecting IgG from degradation. Specifically, pinocytosed IgG is captured by FcRn in the acidic endosome, recycled back to the cell surface, and then released back into the circulation at a physiological serum pH of 7.4 (15, 16, 17). IgG that is not bound by FcRn is targeted to the lysosome and degraded. Because FcRn is important in regulating IgG homeostasis, modulating the interaction between Fc and FcRn through protein engineering is one method for improving the pharmacokinetics of therapeutic Abs, as demonstrated by previous rodent and primate studies (13, 18, 19, 20, 21, 22, 23, 24). In terms of engineering approaches, some combinatorial library efforts have focused on isolating favorable mutations in human or murine Fc by screening against murine FcRn (18, 19). Due to the differences in binding specificity between human and murine FcRn, mutations that specifically enhance primate FcRn binding may be missed in this approach. Conversely, primate-screened variants may not show improved pharmacokinetics in mice (25, 26). This was observed for the N434A variant (mutations are shown in single-letter amino acid code, with Fc positions indicated by Eu numbering) (27), which showed improved affinity toward human and cynomolgus monkey (Macaca fascicularis) FcRn, but not toward murine FcRn. When N434A was evaluated in normal mice, there was no change in pharmacokinetics relative to wild type (WT) (28, 29). However, when N434A was evaluated in human FcRn knockin mice, extended serum t1/2 over WT was observed (29), consistent with its human FcRn-binding properties. These studies highlight the importance of using the appropriate species of FcRn for in vitro IgG variant screens and for in vivo pharmacokinetic studies. In a recent review, Presta (30) has summarized the somewhat conflicting data among several primate pharmacokinetics (PK) studies that included different FcRn-binding IgG variants (22, 23). In particular, as Presta points out, these data have led to uncertainty and controversy in understanding the relationship between FcRn-binding affinity and t1/2 in primates (30). A number of studies in mice, rhesus, and cynomolgus monkeys have demonstrated that increasing the pH 6-binding affinity of IgGs can prolong t1/2 (18, 19, 20, 21, 31). These studies have also demonstrated that FcRn-binding affinity at pH 7.4 is an additional determinant of IgG pharmacokinetics. Specifically, certain variants with increased pH 7.4-binding affinity to mouse FcRn exhibited decreased clearance (CL) in mice (19). However, primate FcRn has distinct IgG-binding properties in terms of absolute affinity and pH dependence of binding affinity as compared with rodent FcRn (19, 25); therefore, careful primate PK studies are needed to understand the primate FcRn system. To date, there have been no reports examining the pharmacokinetics in primates of human IgG variant Abs that also show significant binding to human FcRn at pH 7.4 (19). From the in vitro characterization of Abs that we report in this study, many FcRn-binding variants show a range of high pH-binding improvements corresponding roughly to their relative increases in low pH-binding affinity. We were interested in understanding more quantitatively how significant high pH binding may affect the pharmacokinetics of humanized IgG variants in primates. In this study, combinatorial phage-displayed human IgG1 Fc libraries were constructed to screen directly against human FcRn and to isolate Fc mutations with increased binding affinity to human FcRn. Reasoning that multiple mutations within the C region of an IgG could lead to undesirable physical properties, or to anti-drug Ab responses if used in the context of a multiple-dose therapeutic Ab, we sought to identify point mutations with improved FcRn binding. We therefore focused on single-site Fc-phage libraries, conducting structure-guided, alanine-scan guided, and saturation mutagenesis to identify point mutants with increased pH 6 binding to human FcRn. A number of novel favorable Fc mutations were isolated, and some of the mutations were confirmed to be specific for enhancing primate (human or cynomolgus monkey) FcRn binding in the context of humanized anti-HER2 IgG1 (h4D5; trastuzumab). These favorable mutations were combined to construct a panel of combination variants with affinities ranging over two orders of magnitude. In vitro binding analyses of these variants, along with point mutants, demonstrated that low pH and high pH FcRn-binding improvements are tightly coupled over a wide affinity range, suggesting a limit to the benefits of improved low pH binding. For in vivo studies, two single mutations, N434A and N434W, which, respectively, gave moderate and strong binding improvements to human FcRn, were used to generate corresponding variants of a humanized Ab targeting a B cell surface receptor (anti-human B cell surface receptor (anti-hBSR)). The pharmacokinetic profiles of these two variants along with WT were evaluated in cynomolgus monkey. Results in this study show that N434A exhibited a ∼2-fold improvement in CL and t1/2, but N434W, which showed significant binding to human and cynomolgus monkey FcRn at pH 7.4, displayed similar CL compared with that of WT. Overall, the PK results presented in this study of two variants with vastly different FcRn-binding affinities provide further insight into the relationship between FcRn affinity and in vivo pharmacokinetics, which is important for the engineering of improved therapeutic Abs. Construction of a human FcRn expression plasmid was previously described (13). The cynomolgus-monkey FcRn and murine FcRn expression plasmids were constructed in a similar fashion as the human FcRn plasmid (32). The expression and purification methods for the FcRn were the same, except that human and cynomolgus monkey FcRn were expressed in adenovirus-transformed human embryonic kidney cells 293, whereas murine FcRn was expressed in Chinese hamster ovary cells. Briefly, FcRn plasmid was transfected into the cells using FUGENE (Roche), according to the manufacturer’s protocol. After 24 h of incubation with the transfection complex, cells were switched to serum-free PSO4 medium (Genentech; 1 g/L Pluronic F-68, 5.5 g/L combination nonselect medium (Life Technologies), 4.3 g/L glucose, 1.22 g/L sodium bicarbonate, 0.1 g/L gentamicin sulfate (pH 7.1); 350 milliosmolar) supplemented with 5 mg/L recombinant bovine insulin and trace elements and grown for 5 days. Supernatants were collected and purified by nickel-nitrilotriacetic acid chromatography (Qiagen). Eluted proteins were then concentrated, and further purified by size exclusion chromatography on a Superdex 75 column (GE Healthcare) with PBS pH 6.0 as the running buffer. Fractions containing monomeric FcRn were pooled, and the concentration was determined by absorbance measurement at 280 nm. Human FcRn was biotinylated using the EZlink Sulfo-NHS-LC-biotin kit, according to the manufacturer’s protocol (Pierce). Two phagemid vectors, pW0437 and pW0439, were constructed, respectively, with the human IgG1 Fc gene containing aa 230–447 (Eu numbering) and human IgG1 Fc gene containing aa 226–447 (W. Delano, unpublished data). Vector pW0437 encoded a hinge disulfide-free Fc and was used as the template for the first library mutagenesis. Meanwhile, vector pW0439 encoded an Fc variant with a single hinge cysteine and was used as the template for the second library. Libraries were generated using a Kunkel-based strategy (33). Briefly, uridinylated ssDNA templates of either pW0437 or pW0439 were generated by using CJ236 Escherichia coli. Individual primers were designed for saturation mutagenesis at each residue position. For example, to generate a library at position 284, primer 5′-GTGGACGGCGTGGAGNNKCATAATGCCAAGACA-3′ was annealed to the uridinylated ssDNA template. Residues selected for the first mutagenesis were positions 248–259, 284–290, 306–315, 343, 385–387, and 428–437 (Eu numbering) (27). Residues selected for the second mutagenesis were positions 248–259, 301–309, 311–317, 378–382, 424–433, and 436–437. After the mutagenesis reactions, a small aliquot of the reaction mixture was transformed into E. coli XL-1 cells (Stratagene), according to the manufacturer’s protocol. There were 43 and 47 reactions, respectively, for the first and second library. Transformation efficiency was measured by plating a small aliquot of the transformed cells on Luria-Bertani plates containing 50 μg/ml carbenicillin. Transformed cells were then grown in 2YT medium containing 50 μg/ml carbenicillin and 1010 PFU/ml VCSM13 helper phage overnight at 37°C. Maxisorp immunoplates (Nunc) were first coated with 5 μg/ml neutravidin (Pierce) overnight at 4°C, and then blocked with Superblock (Pierce) at room temperature. After blocking, the neutravidin-coated plates were incubated with 2 μg/ml biotinylated human FcRn for 1 h at room temperature. For the first panning experiment, individual phage libraries were pooled together. Phage were purified using 20% polyethylene glycol 8000/2.5 M NaCl and then resuspended in PBS (pH 6.0)/0.5% BSA/0.05% Tween 20. Next, purified phage were added to 8 wells of the human FcRn-captured plates for 2 h at room temperature. After incubation, wells were washed 10 times with PBS pH 6.0, and bound phage were eluted by incubation with PBS pH 7.4 for 30 min at room temperature. Eluted phage were used to infect log-phase XL-1 cells for phage propagation. After six rounds of panning, clones were picked and sequenced. For the second panning experiment, phage supernatants of individual libraries were used for panning. Phage supernatants were adjusted to pH 6.0 with PBS and hydrochloric acid, and also supplemented with 0.1% BSA. Adjusted phage supernatants of each library were added directly to the human FcRn-captured plate. One well was used for each library. After incubation, wells were washed five times with PBS pH 6.0, and bound phage were then eluted by incubation with PBS pH 7.4 or PBS pH 6.8 for 30 min at room temperature. Three rounds of panning were performed for each elution scheme, and enriched clones at each residue position were sequenced. Two humanized IgG1 Abs, anti-HER2 (h4D5; trastuzumab) (34) and anti-B cell surface receptor (anti-hBSR), were used as the parental Abs in this study. Human IgG1 variants were transiently expressed using pRK-based plasmids. Kunkel-based site-directed mutagenesis was used to generate all of the IgG1 variants (33). Plasmids containing the variant H chain and the WT L chain were cotransfected into 293 cells by FUGENE, according to the manufacturer’s protocol. After 24 h of incubation with the transfection complexes, transfected cells were cultured with serum-free medium PSO4 supplemented with 5 mg/L insulin and trace elements for 5 days. Supernatants were collected and conditioned with 1 M Tris (pH 8.0) and 5 M sodium chloride (NaCl) to give a final concentration of 30 mM Tris and 50 mM NaCl. Conditioned supernatants were then purified using protein A chromatography (Pierce). Bound IgG1 was eluted from the protein A column with 0.1 M glycine buffer (pH 3.0). Purified IgG1 was concentrated and injected over a Superdex-200 size exclusion chromatography column to remove any aggregates. Monomeric IgG1 fractions were pooled together and later used for the binding studies. WT and variant IgG1 concentrations were calculated using absorbance at 280 nm. Competitive binding assays using a BIAcore 3000 instrument (GE Healthcare) were performed to rank the FcRn affinities of the variants. Briefly, a detection Ab (h4D5) was coupled onto a sensor chip using an amine-coupling kit. CM5 sensor chips were activated with N-ethyl-N′-(3-dimethylaminopropyl) carbodiimide hydrochloride/N-hydroxysuccinimide for 7 min at 5 μl/min. A total of 20 μg/ml WT h4D5 in 10 mM sodium acetate (pH 4.0) was injected for 30 s at a flow rate of 10 μl/min over the activated chip to give final binding response units (RUs) of 100–200. After conjugation, the chip was blocked by an injection of 35 μl of 1 M ethanolamine hydrochloride at 5 μl/min. Meanwhile, 500 nM human FcRn and 1 μM h4D5 variants at position 434 were preincubated in PBS pH 6.0/0.01% P20 for 30 min at room temperature. After incubation, the mixture was injected over the WT h4D5-coated sensor chip at 30 μl/min, and the RUs after 1 min of injection were recorded. The chip was then regenerated with a 30-s pulse of 0.1 M Tris (pH 9.0)/0.15 M NaCl. A similar competitive binding assay was used to evaluate the binding of phage-selected variants to human FcRn at pH 6.0 and 6.9, the latter pH chosen to evaluate higher pH behavior while maintaining sufficient binding sensitivity for measurements. In this assay, h4D5(N434W) was coated onto a CM5 chip, as above. The running buffer for the binding experiment was either PBS pH 6.0 or 6.9 containing 0.01% P20. The assay at pH 6.0 was performed with 100 nM human FcRn and 300 nM variants, whereas the assay at pH 6.9 was performed with 200 nM human FcRn and 600 nM variants. Two different surface plasmon resonance-binding experiments were used to measure the binding affinities of human variants to human and murine FcRn. The first assay format involved coating the variants directly onto the chips using an amine-coupling kit. The detailed conjugation protocol was described earlier. Briefly, 20 μg/ml each h4D5 Fc variant was injected for 30 s to 2 min during conjugation. Typically, a maximum of 80–200 RUs was obtained from the conjugation. The running buffer for the binding experiments was PBS/0.01% P20 at pHs ranging from 6 to 7.4 depending on the experimental conditions. Soluble human FcRn dilutions from 20 μM to 0.15 nM were injected at a flow rate of 20 μl/min for 5 min over the variant-coated sensor chip at 25°C. Steady-state RUs were recorded at the end of the injection. The chip was regenerated with a 30-s pulse of 0.1 M Tris (pH 9.0)/0.15 M NaCl. FcRn was also injected over an unconjugated surface for background subtraction. The monovalent equilibrium-binding constant (KD) was calculated using the BIAevaluation software (GE Healthcare). The second assay involved coating FcRn onto the sensor chip. Briefly, a CM5 sensor chip was activated with N-ethyl-N′-(3-dimethylaminopropyl) carbodiimide hydrochloride/N-hydroxysuccinimide for 7 min at 5 μl/min. A total of 100 μg/ml FcRn in 10 mM sodium acetate (pH 4.0) was injected for 30 s to 2 min at a flow rate of 10 μl/min over the activated chip to give ∼100 RUs. After conjugation, the FcRn-coupled chip was blocked by an injection of 35 μl of 1 M ethanolamine hydrochloride at 5 μl/min. The running buffer for the binding experiment was either PBS pH 6.0 or pH 7.4 containing 0.01% P20. WT and variants were buffer exchanged into either the pH 6.0 or pH 7.4 running buffer. All the experiments were performed at 25°C. Dilutions of variants ranging from 1 μM to 0.5 nM were flowed over the FcRn-coated chip at 2 μl/min for 6 min, and the RUs were measured once equilibrium had been reached. Regeneration was achieved with a 30-s pulse of 0.1 M Tris (pH 9.0). Fc variants were also injected over an unconjugated flowcell on the sensor chip to allow subtraction of background-nonspecific binding from the binding to the FcRn-coupled flowcell. Apparent equilibrium dissociation constants were estimated by plotting the steady-state RUs against injection concentrations. The non-good laboratory practice PK comparison study was approved by the Institutional Animal Care and Use Committee and conducted at Shin Nippon Biomedical Laboratories. Five male and five female monkeys were assigned to each of groups 1, 2, and 3 and given a single, 20 mg/kg i.v. injection of WT anti-hBSR, Fc variant N434A, or Fc variant N434W, respectively. The doses were administered at a rate of ∼6 ml/min. Blood samples (∼1 ml) for PK analysis were collected at the following time points: predose, 30 min, 6 h, and 24 h postdose, and 2, 3, 5, 7, 9, 14, 17, 21, 28, 35, 42, 49, 56 days postdose. The serum concentrations of WT and variants were detected using an Ag-captured ELISA. The minimum dilution of cynomolgus monkey serum samples was 1/100, and the standard curve range was 0.5–32 ng/ml. The minimum quantifiable concentration was 50 ng/ml. Nominal sample collection times were used in the data analysis. Anti-therapeutic Ab (ATA) responses to WT, N434A, or N434W were determined using a bridging electrochemiluminescence assay. Biotinylated WT was used to capture ATAs, and ruthenium-conjugated WT was used as detection. 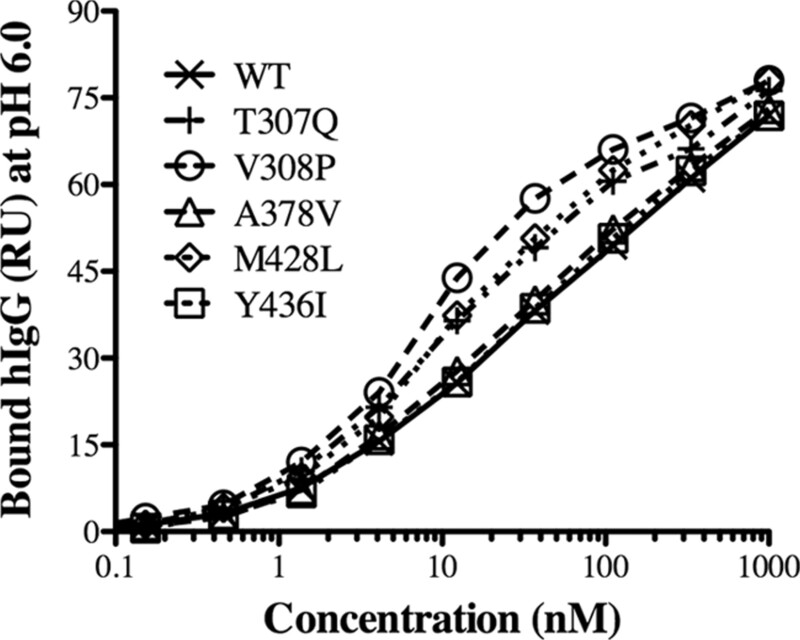 Signal of the ATA complex with the WT conjugates was detected using a Bioveris M384 analyzer. A two-compartment model with i.v.-bolus input, first-order elimination, and microrate constants (Model 7) (WinNonlin Pro v.5.0.1; Pharsight) was fit to the concentration-time data for each animal. Statistical analysis was performed using SAS Institute version 9 software. Dunnett’s procedure was used to examine the statistical evidence for differences between PK parameters of the WT group and PK parameters of the N434A and N434W groups. CL and exposure were analyzed on the logarithmic scale, whereas t1/2 parameters were analyzed on the original scale. The Dunnett-adjusted p values for these differences were reported; p values less than 0.05 were considered to be statistically significant. Human IgG1 Fc was displayed at the surface of M13 phage as a fusion to the gene III coat protein. Formation of the Fc dimer on phage was possible due to the read-through of an amber stop codon located between the Fc and gene III. Phage-displayed Fc exhibited the same pH-dependent binding to human FcRn in ELISA as soluble human IgG1 (data not shown). Previous structural and biochemical studies illustrated that the interface between the CH2 and CH3 domains of an IgG Fc was responsible for binding FcRn (6, 13, 35). Using the available complex structure of rat Fc-FcRn, rat Fc residues that were within 10Å of rat FcRn in the structure were identified. The human IgG1 Fc counterparts for these residues were chosen as the residues to be mutated in the phage library. There were altogether 43 residues chosen; they were residues 248–259 (Kabat numbering), 284–290, 306–315, 343, 385–387, and 428–437. Separate saturation mutagenesis libraries were generated for each individual position. The theoretical library size at each position was 32, due to the usage of NNK codons during the mutagenesis. All 43 libraries were then pooled together for screening against human FcRn. After six rounds of panning, 43 clones that showed improved binding to human FcRn in a phage ELISA were sequenced. Interestingly, all of the isolated mutations were at residue 434: 39 of 43 clones contained a tryptophan substitution (N434W), 3 had N434Y, and 1 had N434F. Thus, we concluded that aromatic substitutions at residue 434 were highly favorable for improved binding to human FcRn. Previously, an alanine-scan study of human IgG1 Fc against human FcRn showed that an alanine substitution at residue 434 was favorable for improved human FcRn binding (13). Coupled with the phage display results in this study, residue 434 appears to be a hot spot for human FcRn binding. Therefore, saturation mutagenesis was performed to evaluate the effects of all possible amino acid substitutions at this position. The human anti-HER2 IgG1 (h4D5; trastuzumab) was used as the Ab template. 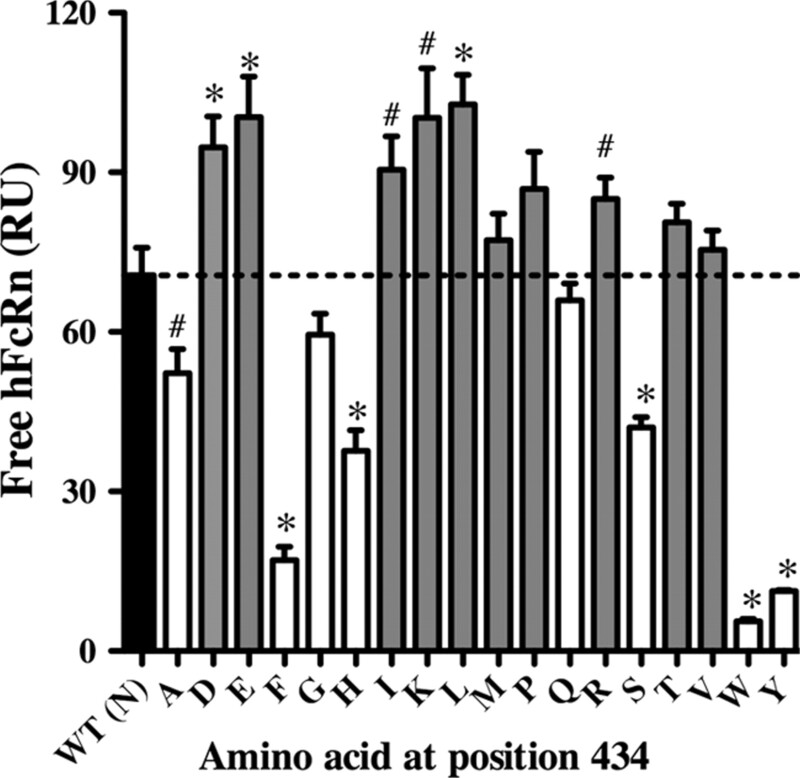 Variants containing each amino acid substitution except cysteine at position 434 were transiently expressed in 293 cells, and their binding against human FcRn was evaluated using a competitive BIAcore assay. In the assay, each variant was preincubated with a fixed concentration of human FcRn, and then the complex was injected over a WT h4D5-coated sensor chip to detect the amount of free FcRn in the mixture. The higher the variant’s affinity toward FcRn, the lower the amount of free FcRn in the mixture, and hence the lower the response (RU) that was measured. Fig. 1⇓ shows that N434W, N434Y, N434F, and N434A all had higher affinity toward human FcRn over the WT, with N434W being the highest affinity variant. Polar substitutions–His, Ser, Gly, and Gln–at this position were also favorable for FcRn binding. Charged residues such as Lys, Arg, Glu, and Asp resulted in reduced affinity. Interestingly, the mutations (N434W, N434Y, and N434F) isolated in our phage screening were the ones with the highest affinity improvements at this position. Moderately affinity-improved mutants such as N434H (the remaining aromatic possibility), N434A, and N434S were not isolated. Our previous screening may have been sufficiently stringent to allow only the highest affinity clones to be isolated, or other effects such as expression bias may have limited the diversity of the final clones isolated. Competitive binding assay of h4D5 variants (substituted with the indicated amino acid at residue position 434) to human FcRn. Each variant was preincubated with FcRn at pH 6.0, and then injected over a WT h4D5-coated chip to detect the amount of free FcRn in solution. The higher the RU, the lower is the variant’s affinity to FcRn. Variants highlighted in □ show improved human FcRn affinity over the WT (∗, p < 0.05; #, p < 0.1). The data are representative of two independent experiments. To isolate favorable mutations at positions other than position 434, a second phage library was constructed based on the results of a previous alanine scan study (13). Shields et al. (13) had identified positions in which Ala substitution resulted in more than 25% change to human FcRn binding. These human FcRn-contact residues were localized in four main regions, from residues 253–256, 303–317, 376–382, and 424–436. We therefore generated separate saturation mutagenesis libraries at each of these residues and adjacent sites: 248–259, 301–317 (excluding H310), 376–382, and 424–437 (excluding N434 and H435). H310 and H435 were not mutated, because they are highly conserved and have been shown to be important for the pH-dependent binding to FcRn across different species (8, 13, 36, 37). In this study, N434A was fixed as constant to increase the base level binding of phage-displayed Fc to human FcRn. There were in total 47 libraries, each with a theoretical diversity of 32. Instead of pooling the libraries together as in the previous screen, these individual libraries were screened individually against human FcRn. After three rounds of panning, several libraries had significant enrichments: those with mutations at positions 250, 252, 256, 307, 308, 378, 428, and 436, and clones were sequenced, yielding the variants shown in Fig. 2⇓A. Interestingly, two previously identified favorable Fc mutations from saturation mutagenesis, T250Q and M428L (20), were also isolated during our screen (Fig. 2⇓A), thus validating our phage-panning process. Favorable mutations were further confirmed by performing phage ELISAs using individually purified mutants (data not shown). These mutations were then incorporated into h4D5 for further evaluation. Isolation of favorable human IgG1 Fc mutations using phage display. A, Identities of the mutations isolated at each residue position after three rounds of panning Fc libraries against human FcRn. For each position, isolated mutations were listed in the descending order of frequency. Positions in which only WT residue was recovered was denoted by “Wildtype.” B, Affinity screening of variants against human FcRn. Selected mutations along with N434A were incorporated into the Fc of 4D5. A competitive binding assay was used to detect the binding of variants toward FcRn at 25°C, at either pH 6.0 or pH 6.9. Free FcRn was measured in this assay; the higher the RU, the lower the variant’s binding affinity to FcRn. The dotted lines represent the RU of parental Fc variant N434A at both pH conditions. The data are representative of two independent experiments. C, Relationship between the binding of variants to human FcRn at pH 6.0 and pH 6.9. Data in B were used to generate the plot. As the Fc variants show improved binding to FcRn at pH 6.0, their corresponding binding at pH 6.9 also increases. WT, N434A, and N434W are denoted by ○, ⋄, and ▴, respectively. D, Sites of selected mutations illustrated on a model of the human IgG1 Fc (based on the Protein Database structure 1D2). The model was created using Pymol (DeLano Scientific, accessed at http://www.pymol.org). Selected Ab h4D5 variants were transiently expressed as double mutants containing the starting mutation N434A and phage-selected mutations (Fig. 2⇑A). The previously reported T250Q and M428L were also incorporated into h4D5 for comparison. The affinities of these variants against human FcRn were compared using the competitive BIAcore assay described earlier. N434W was used as the detection Ab because it affords better sensitivity than WT in this assay. Fig. 2⇑B demonstrates that most of the phage-selected variants showed improved binding toward human FcRn at pH 6.0, and these variants maintain the same pH-dependent binding. Variants at positions T250, M252, S254, T256, T307, V308, Q311, A378, M428, Y436, and T437 demonstrated significant affinity improvements to human FcRn at pH 6.0. However, their binding at high pH increased accordingly with the increase in pH 6 binding (Fig. 2⇑C) despite the fact that these mutations are distributed across several positions on the Fc (Fig. 2⇑D). The monovalent equilibrium-binding constants of the variants were measured by injecting soluble FcRn over variant-coated sensor chips in a BIAcore instrument. As shown in Table I⇓, double mutants such as T307Q/N434A, A378V/N434A, N434A/Y436I, and V308P/N434A displayed 1.5- to 8-fold improvement over the starting single mutant N434A, and these double mutants had comparable or higher affinity than the previously reported double mutant, T250Q/M428L. In addition to being paired with N434A, newly identified mutations such as T307Q and V308P could be paired with more favorable mutations such as N434H or N434Y to generate even higher affinities. By combining different mutations, variants with affinity improvements from 2- to 450-fold over WT could be constructed (Table I⇓). The pH-dependent binding of selected h4D5 variants was further evaluated by measuring the variants’ monovalent dissociation constants against human FcRn at pH ranging from 6 to 7.4. Fig. 3⇓ shows that all of the variants’ KD values increase with increasing pH. Interestingly, the slope of the KD as a function of pH is very similar among all of the variant, ranging from ∼1.6 to 1.8. This relationship enabled us to use binding measurements at pH 6.9 (Fig. 2⇑C) as a surrogate for affinity measurements at higher pH. Monovalent dissociation constants (KD) of h4D5 variants against human FcRn at pH 6 to pH 7.4. h4D5 variants were directly conjugated onto the sensor chip, and various concentrations of human FcRn were injected over the coated sensor chip at pHs ranging from 6.0 to 7.4. KD was then determined by either fitting the kinetic or steady-state binding response using the BIAevaluation software. KD value above 10 μM was not determined. Slope of the best-fit line for each variant, which is determined by fitting the data to the equation: log (KD) = slope × pH + y-intercept, is shown in the parentheses after each variant’s identity. All fits have R2 > 0.98. Phage display was previously used to isolate human variants for binding to murine FcRn (20). Some of the Fc mutations isolated in our screening with human FcRn, such as M252W/Y, S254T, T256D, and N434Y/F, were previously isolated in murine FcRn screen, implying that these mutations are favorable for binding to both human and murine FcRn. In contrast, novel favorable Fc mutations, namely T307Q, V308P, A378V, and Y436I, were identified only in our human FcRn screen. The binding of h4D5 variants carrying these single mutations to murine FcRn was evaluated to determine whether these mutations had primate-specific effects. Although these variants were confirmed to have improved binding to human FcRn (data not shown), Fig. 4⇓ shows that T307Q and V308P had significant binding improvements for murine FcRn as well; A378V and Y436I did not. Thus, novel Fc variants with primate-specific FcRn-binding effects were identified in our phage screen against human FcRn. Binding of human IgG1 WT and Fc variants to murine FcRn. h4D5 variants, which showed improved human FcRn binding, were injected over a murine FcRn-coated sensor chip at pH 6.0, and the steady-state binding RUs were plotted as a function of concentration. 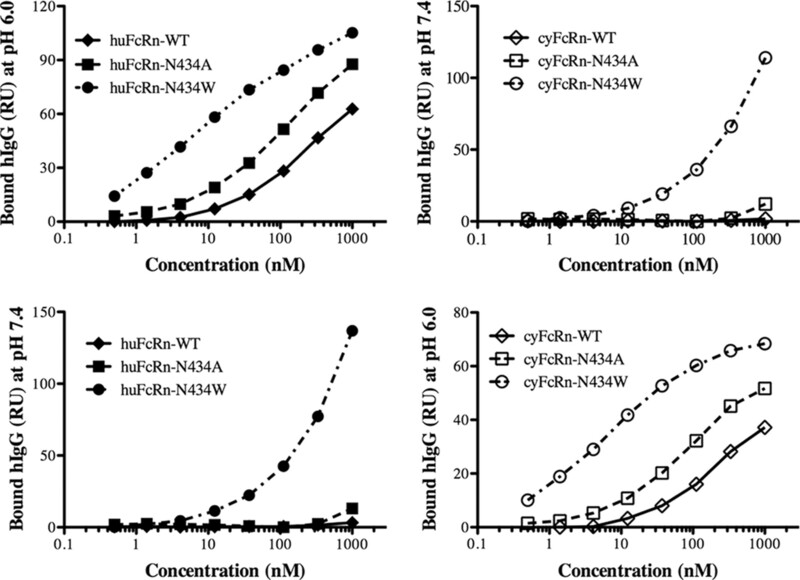 To study the relationship between in vitro FcRn-binding affinity and in vivo pharmacokinetics, two variants of anti-hBSR Ab were constructed: N434A and N434W, which had, respectively, ∼4- and 80-fold decrease in apparent KD (Fig. 5⇓) to human FcRn at pH 6.0 compared with WT (apparent KD of WT was ∼1 μM), and similar relative affinity to cynomolgus monkey FcRn. Both WT and N434A exhibited negligible binding to human and cynomolgus monkey FcRn at pH 7.4. In contrast, N434W showed substantial pH 7.4 binding to human and cynomolgus monkey FcRn in the 10–100 nM range. Both variants retain the same binding affinities to Ag and to Fc(γ) receptors I, IIA, IIB, and III (both V158 and F158 allotypes) as WT IgG (data not shown). Binding of WT anti-hBSR and variants, N434A and N434W, to human and cynomolgus monkey FcRn at pH 6.0 and pH 7.4. Human or cynomolgus monkey FcRn was coated on sensor chips. WT and Fc variants were injected over the FcRn-coated chips at 25°C. Steady-state RUs were recorded and plotted as a function of injection concentrations. Amounts of FcRn coated down in each run were different, so comparison should be made only within run. The in vivo pharmacokinetics of Abs anti-hBSR (WT), N434A, and N434W were examined in cynomolgus monkeys following a single i.v. dose of 20 mg/kg. Ag-mediated CL mechanisms (due to binding of the Abs to the cell surface receptor on B cells) do not appear to influence the pharmacokinetics of the Abs at >5 mg/kg doses (our unpublished data). Therefore, nonspecific CL mechanisms (e.g., mediated by FcRn) should dominate the pharmacokinetics with the dosing used in this study. The WT and variant Abs exhibited biphasic disposition following a single i.v. dose of 20 mg/kg, showing a rapid distribution phase followed by a prolonged elimination phase. The average serum concentration-time profiles of each group (n = 10/group) are shown in Fig. 6⇓. Anti-drug Abs were detected in some of the animals from each group and appeared most pronounced in animals receiving WT. However, anti-drug Abs did not appear to affect overall CL. Specifically, within each group, CL for animals that developed anti-drug Abs was similar to CL for animals that did not develop anti-drug Abs. For the WT group, anti-drug Abs appeared to affect terminal t1/2 (t1/2,β) estimates; that is, t1/2,β was slightly higher for animals that did not develop anti-drug Abs (t1/2,β ∼9 days). Average PK parameters shown in Table II⇓ include data from all animals. Pharmacokinetic profiles of the WT anti-hBSR and Fc variants, N434A and N434W, in cynomolgus monkeys following a single i.v. dose of 20 mg/kg. Serum concentrations of the injected Abs were measured by Ag-specific ELISA. Data are represented as the mean ± SD (n = 10 animals/group). LTR = less than reportable value. As shown in Table II⇑, the N434A variant exhibited a significantly increased exposure and decreased CL (∼1.8-fold) compared with WT (p < 0.05). Exposure (AUCinf) and CL were 4510 day*μg/ml and 4.54 ml/day*kg, respectively, for the N434A variant, and 2440 day*μg/ml and 8.40 ml/day*kg, respectively, for WT. The N434A variant also exhibited an increased t1/2,β compared with WT (p < 0.05). Given the potential confounding effects of anti-drug Abs, the increase in t1/2,β of N434A most likely ranges from 1.6- to 2.3-fold over that of the WT (see Discussion). CL and exposure of the N434W variant were not significantly different from that of the WT. 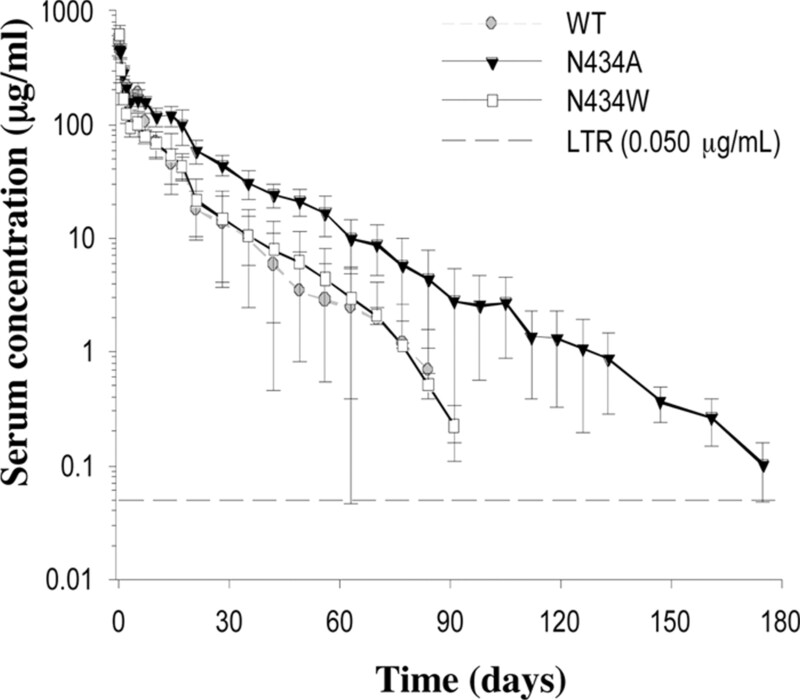 N434W exhibited a slight increase in t1/2,β compared with WT; however, it is possible that this observed difference is due to the more pronounced anti-drug Ab response in animals receiving WT. The α-phase t1/2 of the N434W variant was significantly faster than that of WT, suggesting that this ultra-high affinity Fc variant may have altered distribution kinetics. In this study, phage display was used to engineer the Fc region of human IgG1 for improved binding to human FcRn. Novel human FcRn-specific Fc mutations were isolated and, with the combination of these mutations, a comprehensive panel of variants whose affinities ranged over two orders of magnitude was generated. These variants provided an opportunity to study the relationship between in vitro pH-dependent FcRn-binding affinity and in vivo PK in primates. Two variants (N434A and N434W), having different extents of affinity improvement over a WT Ab, were chosen for a single-dose PK comparison study in cynomolgus monkeys. In this study, the N434A variant, which displayed increased binding affinity to FcRn at pH 6, but negligible binding to FcRn at pH 7.4, exhibited increased exposure, decreased CL, and increased t1/2,β compared with the WT Ab. This suggests that modest increases in FcRn-binding affinity at pH 6 can decrease CL and prolong the t1/2,β of IgGs. In contrast, the N434W variant, which had increased binding to FcRn at both pH 6 and pH 7.4, exhibited very similar pharmacokinetics to that of WT, highlighting the importance of preserving the efficient pH-dependent release IgG at pH 7.4 when engineering Abs for decreased CL. Previously, phage-displayed human Fc libraries have been screened against murine FcRn to isolate variants with increased FcRn-binding affinity, but efforts using the same library to screen against human FcRn were not successful (19). In this study, phage-displayed human Fc libraries were screened directly against human FcRn, using a biotinylated FcRn capture method, to isolate novel human FcRn-specific mutations. Comparisons between the mutations isolated in our screen with those from the previous murine FcRn screen highlight differences between the interaction of human and murine FcRn with human Fc. Mutations isolated at positions 252, 254, and 256 were similar in both screens, suggesting that both human and murine FcRn have similar binding interactions in this region. In contrast, mutations at position 436 highlight specificity differences between human and murine FcRn. It was previously shown that L137 (FcRn)-Y436 (Fc) and E137 (FcRn)-H436 (Fc) are the preferential pairwise interactions for human and mouse, respectively (26). This might explain why, in murine FcRn screens, Y436H was strongly favored (19). However, in our screen, Y436I, which potentially mediates a better hydrophobic interaction with L137 on human FcRn, was preferred (Table I⇑). Not surprisingly, Y436I did not show improved binding toward murine FcRn, as shown in Fig. 4⇑. Overall, novel sets of favorable mutations, some of which are primate specific in their effects, were isolated in our phage efforts using human FcRn. In previously published reports, different methodologies have been used to measure Fc-FcRn interactions, and this has resulted in different affinity values reported for the same Fc variant, rendering it difficult to compare affinity improvements of different mutants (19, 20, 22). For example, several different equilibrium constants (KD) have been reported for WT human IgG1 binding to human and cynomolgus monkey FcRn. Datta-Mannan et al. (22, 23) measured the KD in a bivalent BIAcore assay, in which Abs were injected over a FcRn-coated sensor chip. They reported the WT KD to be ∼100–200 nM at pH 6.0. However, monovalent KD has also been directly measured in a different format of BIAcore assay, which involves flowing soluble FcRn over an Ab-coated sensor chip. Using this method, both Dall'Acqua et al. (19, 31) and our group found the WT KD to be ∼1–2 μM in binding to both human and cynomolgus monkey FcRn. These differences in KD due to different assay formats have also been observed for variants, for example, the double-mutant T250Q/M428L. In this case, a cell surface-binding assay that most likely included avidity effects was used to determine the affinity improvement of the double mutant to both rhesus and human FcRn at pH 6.0 as ∼30-fold (20). Datta-Mannan et al. (23) incorporated the same T250Q/M428L mutations into an anti-TNF Ab and measured the mutant’s affinity to cynomolgus monkey FcRn in the previously mentioned bivalent BIAcore assay as ∼40-fold improved. However, in our monovalent BIAcore assay format, the KD improvement of this double mutant to human FcRn at pH 6.0 was much lower (∼7-fold). This difference may be due in part to the different Ab backgrounds used to construct the double mutants, but is more likely due to the fact that avidity effects in the bivalent assays enhanced the apparent affinity of the double mutant more than the WT. In nature, Abs can interact with membrane-anchored FcRn in a bivalent format. However, it is difficult to compare affinity values measured in bivalent assay formats in which avidity effects may vary from mutant to mutant depending on the mutants’ intrinsic affinities and the concentration of FcRn used in the assay. We argue that monovalent KD between variants and FcRn is a more consistent parameter for comparing the extent of affinity improvement across different variants, and that KD should be measured in an assay format that minimizes avidity effects. The assay format in our work, which involves flowing FcRn over an Ab-coated chip, should allow detection of monovalent KD with minimal avidity contributions. Using the KD of the variants determined at pH ranging from 6 to 7.4, the pH dependency of selected h4D5 variants against human FcRn was characterized quantitatively, as shown in Fig. 3⇑. Results show that all of the variants constructed from different combination of Fc mutations (T250Q, M252Y, T307Q, V308P, M428L, N434A, N434H, and N434Y) exhibit similar pH dependency, including a previously reported variant T250Q/M428L (20). As shown in Fig. 2⇑C, there is a direct correlation of pH 6 affinity improvements with neutral pH improvements for all of the variants tested in this study, regardless of their extent of pH 6.0 affinity improvement. However, due to the very low-affinity interaction at neutral pH, the increase in neutral-pH FcRn affinity for certain moderately improved variants such as T250Q/M428L may not be readily measured depending on the Ab concentration used in the assay and the assay sensitivity. 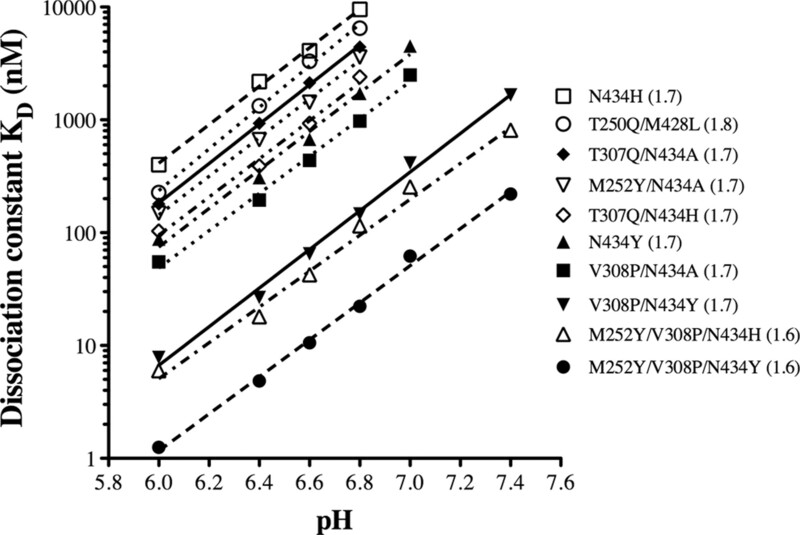 For variants that have substantial affinity improvement at pH 6.0, such as N434W, V308P/N434Y, and M252Y/V308P/N434Y (Table I⇑), neutral pH was more readily measured. Recently, there have been mixed reports describing the relationship between FcRn-binding affinity and serum t1/2 (22, 23, 38). Our PK analysis in cynomolgus monkeys clarifies this relationship and indicates possible sources of discrepancies. The N434A variant of anti-hBSR, which had ∼4-fold increased binding to human and cynomolgus monkey FcRn at pH 6 and negligible binding to human and cynomolgus monkey FcRn at pH 7.4, exhibited significantly increased exposure and decreased CL (∼1.8-fold) compared with the WT Ab. N434A also appeared to have increased t1/2,β compared with the WT Ab; however, the appearance of anti-drug Abs made it difficult to assess the relative difference in t1/2,β between WT and N434A. In general, the appearance of anti-drug Abs is unpredictable, and therefore, it is difficult to explain the observed difference in anti-drug Ab response between these groups. The average t1/2,β of WT was ∼6 and 9 days, respectively, in animals with (n = 8) and without (n = 2) detectable anti-drug Abs. In contrast, the average t1/2,β of N434A (∼14 days) was similar both in animals with (n = 4) and in those without (n = 6) anti-drug Abs. We have obtained similar estimates of t1/2,β for both WT and N434A in follow-up studies (our unpublished observations), in which the incidence of anti-drug Abs was much lower. Taken together, these data suggest that N434A has ∼1.6- to 2.3-fold increased t1/2,β compared with that of WT, and further suggest that the increased FcRn-binding affinity of N434A at pH 6 leads to increased t1/2,β and decreased CL. These results agree well with previous nonhuman primates studies (21, 31). The limits of t1/2 increases from increased FcRn affinity have not been determined. We and others have observed that, as a variant’s affinity to FcRn at pH 6.0 increases, its binding to FcRn at higher pH also increases accordingly (19). Increased affinity at the higher pH is potentially problematic, because it may prevent the release of FcRn-bound IgGs. In this study, the in vivo pharmacokinetics of a Fc variant, N434W, which exhibited increased binding to FcRn at both pH 6 (80-fold increased in apparent KD) and pH 7.4, was evaluated in cynomolgus monkeys. Total CL of the N434W variant was not significantly different from that of the WT. However, the α-phase t1/2 of the N434W variant was significantly faster than that of WT, suggesting that this very high-affinity Fc variant may have altered distribution kinetics. The faster distribution kinetics of N434W may be due to more rapid adsorption or sequestering of N434W into FcRn-expressing tissues or cells. The lack of change in total CL may be due to the fact that the high level of binding at pH 7.4 hinders the release of FcRn-bound N434W back into the circulation, canceling out the benefit of increased affinity at pH 6. Nonetheless, we cannot rule out the possibility that this lack of PK improvement is due to the physical properties of this particular variant, despite the lack of observed aggregation in purified N434W material. We also point out that although Ag-dependent mechanisms do not appear to influence the pharmacokinetics of the anti-hBSR Ab studied in this work, we cannot exclude the possibility of unknown Ag-specific or target cell-specific effects. An association of increased pH 7.4 binding with a lack of PK improvement was previously observed in mouse PK studies of human IgG1 variants. Dall'acqua et al. (19) showed that variants with substantial FcRn affinity at pH 7.4 appeared to have faster CLs over WT Fc in mice. Ultimately, as we observed for N434W, the binding affinity to FcRn at pH 7.4 may become so large that it offsets any potential pharmacokinetic advantage gained by increased binding at pH 6. Importantly, our N434W data give insight, for the first time, into the affinity improvement limit for a variant to achieve improved PK in nonhuman primates; variants with FcRn affinity higher than N434W are not expected to have improved PK in nonhuman primates compared with WT. In total, these results suggest that it is critical to optimize and balance the pH 6 and pH 7.4 affinities to engineer variants with decreased CL and increased t1/2. This is difficult because low pH improvements and high pH improvements are often correlated for Fc variants, as demonstrated in this study, over various sites of mutation and over a wide range of pH 6 FcRn-binding affinities. It appears that there may therefore be an optimal affinity for maximal t1/2 improvement. Nonetheless, the high-affinity variant N434W, which retains a similar pharmacokinetic t1/2 as WT, may be useful for blocking the recycling function of FcRn in conditions such as autoimmune disease, thereby reducing the t1/2 of endogenous IgG (29, 39). We thank the Genentech oligonucleotide synthesis group for primers, DNA sequencing group for sequence analysis, and Protein Chemistry Department for help in purifying the Abs. Andy Yeung, Maya Leabman, Julia Qiu, Camellia Adams, Samantha Lien, Melissa Starovasnik, and Henry Lowman are current employees and shareholders of Genentech, Inc. Jonathan Marvin is a former employee of Genentech, Inc.
↵1 A.Y. and M.K.L. contributed equally to this work. ↵4 Abbreviations used in this paper: FcRn, FcR neonatal; anti-hBSR, anti-humanized B cell surface receptor; ATA, anti-therapeutic Ab; β2m, β2-microglobulin; CL, clearance; PK, pharmokinetics; RU, response unit; t1/2,β, terminal t1/2; WT, wild type. Roopenian, D. C., G. J. Christianson, T. J. Sproule, A. C. Brown, S. Akilesh, N. Jung, S. Petkova, L. Avanessian, E. Y. Choi, D. J. Shaffer, et al 2003. The MHC class I-like IgG receptor controls perinatal IgG transport, IgG homeostasis, and fate of IgG-Fc-coupled drugs. J. Immunol. 170: 3528-3533. Ghetie, V., E. S. Ward. 2000. Multiple roles for the major histocompatibility complex class I-related receptor FcRn. Annu. Rev. Immunol. 18: 739-766. Roopenian, D. C., S. Akilesh. 2007. FcRn: the neonatal Fc receptor comes of age. Nat. Rev. Immunol. 7: 715-725. Israel, E. J., D. F. Wilsker, K. C. Hayes, D. Schoenfeld, N. E. Simister. 1996. Increased clearance of IgG in mice that lack β2-microglobulin: possible protective role of FcRn. Immunology 89: 573-578. Ward, E. S., J. Zhou, V. Ghetie, R. J. Ober. 2003. Evidence to support the cellular mechanism involved in serum IgG homeostasis in humans. Int. Immunol. 15: 187-195. West, A. P., Jr, P. J. Bjorkman. 2000. 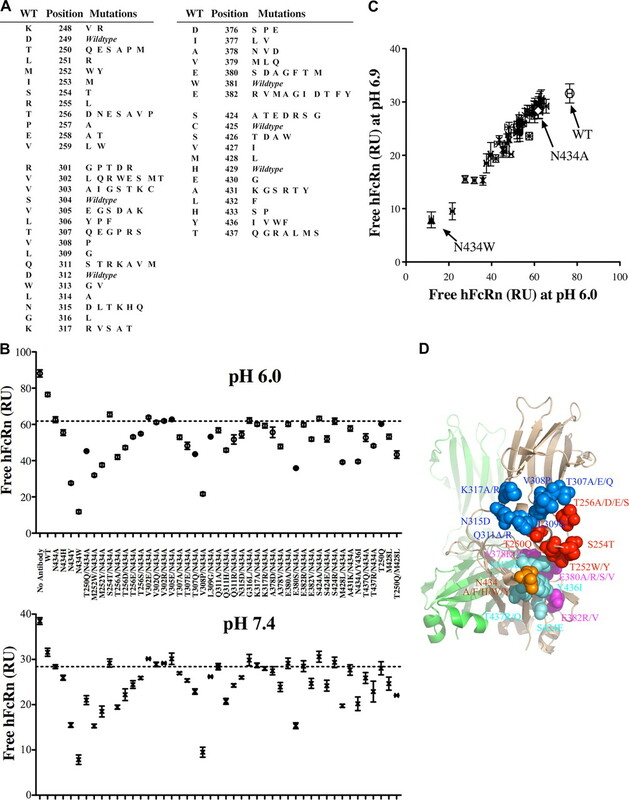 Crystal structure and immunoglobulin G binding properties of the human major histocompatibility complex-related Fc receptor. Biochemistry 39: 9698-9708. Burmeister, W. P., L. N. Gastinel, N. E. Simister, M. L. Blum, P. J. Bjorkman. 1994. Crystal structure at 2.2 A resolution of the MHC-related neonatal Fc receptor. Nature 372: 336-343. Vaughn, D. E., P. J. Bjorkman. 1998. Structural basis of pH-dependent antibody binding by the neonatal Fc receptor. Structure 6: 63-73. Ellinger, I., M. Schwab, A. Stefanescu, W. Hunziker, R. Fuchs. 1999. IgG transport across trophoblast-derived BeWo cells: a model system to study IgG transport in the placenta. Eur. J. Immunol. 29: 733-744. Bitonti, A. J., J. A. Dumont, S. C. Low, R. T. Peters, K. E. Kropp, V. J. Palombella, J. M. Stattel, Y. Lu, C. A. Tan, J. J. Song, et al 2004. Pulmonary delivery of an erythropoietin Fc fusion protein in non-human primates through an immunoglobulin transport pathway. Proc. Natl. Acad. Sci. USA 101: 9763-9768. Dickinson, B. L., K. Badizadegan, Z. Wu, J. C. Ahouse, X. Zhu, N. E. Simister, R. S. Blumberg, W. I. Lencer. 1999. Bidirectional FcRn-dependent IgG transport in a polarized human intestinal epithelial cell line. J. Clin. Invest. 104: 903-911. Deane, R., A. Sagare, K. Hamm, M. Parisi, B. LaRue, H. Guo, Z. Wu, D. M. Holtzman, B. V. Zlokovic. 2005. IgG-assisted age-dependent clearance of Alzheimer’s amyloid β peptide by the blood-brain barrier neonatal Fc receptor. J. Neurosci. 25: 11495-11503. Shields, R. L., A. K. Namenuk, K. Hong, Y. G. Meng, J. Rae, J. Briggs, D. Xie, J. Lai, A. Stadlen, B. Li, et al 2001. High resolution mapping of the binding site on human IgG1 for FcγRI, FcγRII, FcγRIII, and FcRn and design of IgG1 variants with improved binding to the FcγR. J. Biol. Chem. 276: 6591-6604. Martin, W. L., A. P. West, Jr, L. Gan, P. J. Bjorkman. 2001. Crystal structure at 2.8 A of an FcRn/heterodimeric Fc complex: mechanism of pH-dependent binding. Mol. Cell 7: 867-877. Ober, R. J., C. Martinez, X. Lai, J. Zhou, E. S. Ward. 2004. Exocytosis of IgG as mediated by the receptor, FcRn: an analysis at the single-molecule level. Proc. Natl. Acad. Sci. USA 101: 11076-11081. Ober, R. J., C. Martinez, C. Vaccaro, J. Zhou, E. S. Ward. 2004. Visualizing the site and dynamics of IgG salvage by the MHC class I-related receptor, FcRn. J. Immunol. 172: 2021-2029. Prabhat, P., Z. Gan, J. Chao, S. Ram, C. Vaccaro, S. Gibbons, R. J. Ober, E. S. Ward. 2007. Elucidation of intracellular recycling pathways leading to exocytosis of the Fc receptor, FcRn, by using multifocal plane microscopy. Proc. Natl. Acad. Sci. USA 104: 5889-5894. Ghetie, V., S. Popov, J. Borvak, C. Radu, D. Matesoi, C. Medesan, R. J. Ober, E. S. Ward. 1997. Increasing the serum persistence of an IgG fragment by random mutagenesis. Nat. Biotechnol. 15: 637-640. Dall'Acqua, W. F., R. M. Woods, E. S. Ward, S. R. Palaszynski, N. K. Patel, Y. A. Brewah, H. Wu, P. A. Kiener, S. Langermann. 2002. Increasing the affinity of a human IgG1 for the neonatal Fc receptor: biological consequences. J. Immunol. 169: 5171-5180. Hinton, P. R., M. G. Johlfs, J. M. Xiong, K. Hanestad, K. C. Ong, C. Bullock, S. Keller, M. T. Tang, J. Y. Tso, M. Vasquez, N. Tsurushita. 2004. Engineered human IgG antibodies with longer serum half-lives in primates. J. Biol. Chem. 279: 6213-6216. Hinton, P. R., J. M. Xiong, M. G. Johlfs, M. T. Tang, S. Keller, N. Tsurushita. 2006. An engineered human IgG1 antibody with longer serum half-life. J. Immunol. 176: 346-356. Datta-Mannan, A., D. R. Witcher, Y. Tang, J. Watkins, W. Jiang, V. J. Wroblewski. 2007. Humanized IgG1 variants with differential binding properties to the neonatal Fc receptor: relationship to pharmacokinetics in mice and primates. Drug Metab. Dispos. 35: 86-94. Datta-Mannan, A., D. R. Witcher, Y. Tang, J. Watkins, V. J. Wroblewski. 2007. Monoclonal antibody clearance: impact of modulating the interaction of IgG with the neonatal Fc receptor. J. Biol. Chem. 282: 1709-1717. Dall'Acqua, W. F., P. A. Kiener, H. Wu. 2006. Properties of human IgG1s engineered for enhanced binding to the neonatal Fc receptor (FcRn). J. Biol. Chem. 281: 23514-23524. Vaccaro, C., R. Bawdon, S. Wanjie, R. J. Ober, E. S. Ward. 2006. Divergent activities of an engineered antibody in murine and human systems have implications for therapeutic antibodies. Proc. Natl. Acad. Sci. USA 103: 18709-18714. Zhou, J., F. Mateos, R. J. Ober, E. S. Ward. 2005. Conferring the binding properties of the mouse MHC class I-related receptor, FcRn, onto the human ortholog by sequential rounds of site-directed mutagenesis. J. Mol. Biol. 345: 1071-1081. Kabat, E. A., T. T. Wu, H. M. Perry, K. S. Gottesman, C. Foeller. 1991. Sequences of Proteins of Immunological Interest 5th Ed. U.S. Department of Health and Human Services, Bethesda, MD. Medesan, C., D. Matesoi, C. Radu, V. Ghetie, E. S. Ward. 1997. Delineation of the amino acid residues involved in transcytosis and catabolism of mouse IgG1. J. Immunol. 158: 2211-2217. Petkova, S. B., S. Akilesh, T. J. Sproule, G. J. Christianson, H. Al Khabbaz, A. C. Brown, L. G. Presta, Y. G. Meng, D. C. Roopenian. 2006. Enhanced half-life of genetically engineered human IgG1 antibodies in a humanized FcRn mouse model: potential application in humorally mediated autoimmune disease. Int. Immunol. 18: 1759-1769. Presta, L. G.. 2008. Molecular engineering and design of therapeutic antibodies. Curr. Opin. Immunol. 20: 460-470. Dall'acqua, W. F., P. A. Kiener, H. Wu. 2006. Properties of human IgG1s engineered for enhanced binding to FcRn. J. Biol. Chem. 281: 23514-23524. Presta, L. G., and A. K. Namenuk. 2005. Non-human primate Fc receptors and methods of use. United States Patent Application Publication 2005/0054046 A1. Kunkel, T. A., J. D. Roberts, R. A. Zakour. 1987. Rapid and efficient site-specific mutagenesis without phenotypic selection. Methods Enzymol. 154: 367-382. Carter, P., L. Presta, C. M. Gorman, J. B. Ridgway, D. Henner, W. L. Wong, A. M. Rowland, C. Kotts, M. E. Carver, H. M. Shepard. 1992. Humanization of an anti-p185HER2 antibody for human cancer therapy. Proc. Natl. Acad. Sci. USA 89: 4285-4289. Burmeister, W. P., A. H. Huber, P. J. Bjorkman. 1994. Crystal structure of the complex of rat neonatal Fc receptor with Fc. Nature 372: 379-383. Raghavan, M., V. R. Bonagura, S. L. Morrison, P. J. Bjorkman. 1995. Analysis of the pH dependence of the neonatal Fc receptor/immunoglobulin G interaction using antibody and receptor variants. Biochemistry 34: 14649-14657. Kim, J. K., M. Firan, C. G. Radu, C. H. Kim, V. Ghetie, E. S. Ward. 1999. Mapping the site on human IgG for binding of the MHC class I-related receptor, FcRn. Eur. J. Immunol. 29: 2819-2825. Gurbaxani, B., L. L. Dela Cruz, K. Chintalacharuvu, S. L. Morrison. 2006. Analysis of a family of antibodies with different half-lives in mice fails to find a correlation between affinity for FcRn and serum half-life. Mol. Immunol. 43: 1462-1473. Vaccaro, C., J. Zhou, R. J. Ober, E. S. Ward. 2005. Engineering the Fc region of immunoglobulin G to modulate in vivo antibody levels. Nat. Biotechnol. 23: 1283-1288.